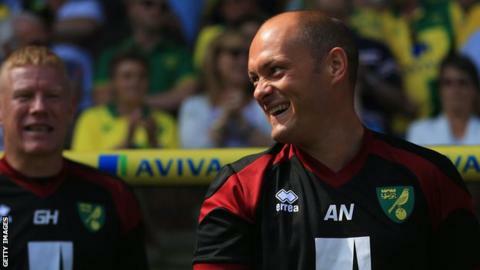 Norwich City manager Alex Neil says his club are not seen as a "good proposition" for some players. The Canaries have signed five players - including Robbie Brady and Andre Wisdom - since their top-flight promotion. "When you're an established Premier League team it's much easier to attract top-quality players," said Neil. "When you go up, the ratio that go back down, no player wants to play in the Championship if they see themselves as a top Premier League player." Meanwhile, Jacob and Josh Murphy, both 20, have signed new two-year deals, keeping them at Carrow Road until at least the summer of 2017. Former Hamilton manager Neil took Norwich back to the Premier League at the first attempt through the play-offs last season, beating Middlesbrough 2-0 at Wembley. And the Scot says the support that day shows the potential his club has to new players. "I would look at Wembley last year, 40,000 fans, the manner in which we play in terms of style, the dedication of supporters and the fact we've been a Premier League team," the 34-year-old told BBC Radio Norfolk. "Towards the end of last season we showed we were too good for the Championship, so there's no reason to suggest why we can't be an established Premier League team." Neil also added you get better value for players from abroad than if you buy from another English club. "You look at some of the transfers over the summer, and most of the high ones are British players," he said. "You look at Raheem Sterling, I can't imagine someone being abroad and having played one or two seasons going for £49m."